Apartment is situated on the groundfloor and it is brand new and very comfortable. It has a lot of light and big garden. 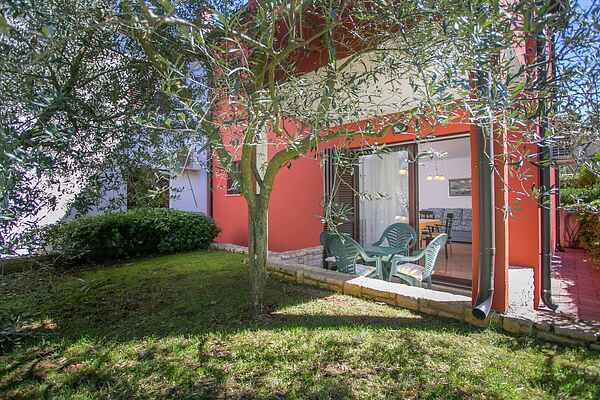 It consists of a double bedroom, a bedroom with two single beds, a kitchen with dinning room and living room, a bathroom with a tub and a terrace with garden furniture. The kitchen is fully equipped with fridge, 2 electric and 2 gas ring hubs and an oven. In the living room there is a SAT TV. The apartment has bed linen and towels and air conditioning. It has a nice terrace with view on the garden. There is a covered private parking place in front of the house.